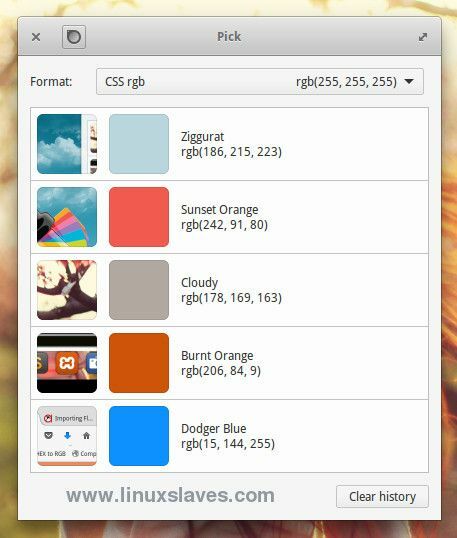 2 Linux apps for choosing a color for Ubuntu, Linux Mint, Elementary etc - If you’re looking for a simple and quick tools to pick a color from your screen, images, photos and etc then you're on the right track. A color picker allows you to identify the color codes of any color present on your screen. This tools can be very helpful for creating or editing an image, programming, writing HTML language or setting up a web page, etc. There are many free color pickers to choose from. But, we will tell you the two of advance and simple tools for your Linux such as Ubuntu, Linux Mint, Elementary, and other Linux distro. 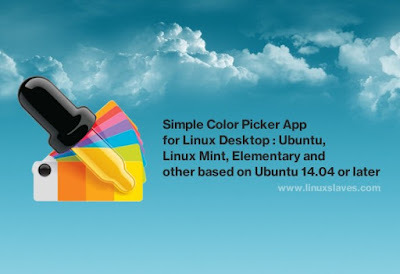 Gpick is an advanced color picker and palette editing tool. It lets you export to Inkscape/Gimp Palette (*.gpl), Adobe Swatch Exchange (*.ase), Alias/WaveFront Material (*.mtl), Cascaded Style Sheet (*.css) formats. Magnification and mouse pointer control with the keyboard. Oversampling with five falloff types: Multiple pixel values are averaged to help picking colors from sources with noise, patterns and etc, where each pixel is different and overall color is produced by different amounts of particular color. Mix two or more colors using the variable number of steps and different mixing types. Once installed, you can open it from Ubuntu dash, or slingshot launcher on Elementary. Or you can download it from Github - git repository hosting service. Pick lets you pick colours from anywhere on your screen. Choose the colour you want and Pick remembers it, names it, and shows you a screenshot so you can remember where you got it from. It's small, compact and totally open-source. The application is available for Ubuntu 14.04 LTS, 15.10, 16.04 LTS Xenial Xerus, and work on any Ubuntu-based distribution : Elementary OS, Linux Mint, and other based on Ubuntu 14.04 or later. Get Pick .deb installer http://kryogenix.org/code/pick/. What is Best of Both? With so many features included, Gpick is still the best I think. What about you? Let us know your own thoughts on it, what you’d like to see it add next, etc. in the comments below. So it's all I can write about 2 great color picker tools for Ubuntu, Mint, Elementary and Derivatives System. Hope this post help you when creating or editing an image, writing HTML language or setting up a web page. Thanks for visiting Linuxslaves!